So Why Not a Big Bike? So much gets said in motorcycle riding circles about motorcycle size. Prominent naysayers hail the trend of larger adventure-style motorcycles coming to market with the fevered zeal of sandwich-board wearing religious zealots crying out about the end of the world from city street corners. But instead of demanding that we repent our sins to Jesus, they try to shame those of us who like to ride heavy motorcycles on the dirt, saying that our bikes are “too heavy” and that we’d be better off with something smaller. Disciples of this “moto-size,” religion are also want to plague social media feeds. Always quick to interrupt otherwise civil threads with some shrill vitriol about why we ride the wrong kind of motorcycle. Like the rapture nuts on street corners, I usually pay people like this little mind. But lately I’m finding their rants more difficult to leave unanswered. Is owning a big bike expensive? I don't really know... How much is a second vehicle (truck) or trailer, gas and time (limited to 55 mph w/trailer) worth? I can ride a few hours to a destination, camp off my bike, ride multiple days off road and then get back on the pavement and ride home. That seems like quite a value to me. But see, I'm the rich guy! That's what a guy who is retiring at 55, has paid of his mortgage, has a tricked out jeep, toy hauler and multiple bikes once told me. I really love my big bike! Yes, it's the first motorcycle I've ever owned (I did ride scooters in high school/college but that doesn't count). Yes, I hadn't nearly a clue about adventure enduro riding (vs. adventure touring) when I first got it. Yes, it did take me quite a while to figure out how to ride it. Yes, I may have found a smaller, less expensive bike easier to learn on. But I really have no regrets. I've seen many people also figure out that riding these bigger bikes off road is not as hard as it seems with a few pointers, feedback and some professional instruction. I have seen SO many great places, met SO many great people and have had a blast riding my big bike. Yes, it does take a different and more focused set of skills to ride a big bike off road but therein lies the fun! Ryan Frazier (GS Trophy Team USA '12) said something to the effect that he prefers a bigger bike off road because they require more input and finesse and that it's the challenge that makes it so much fun. 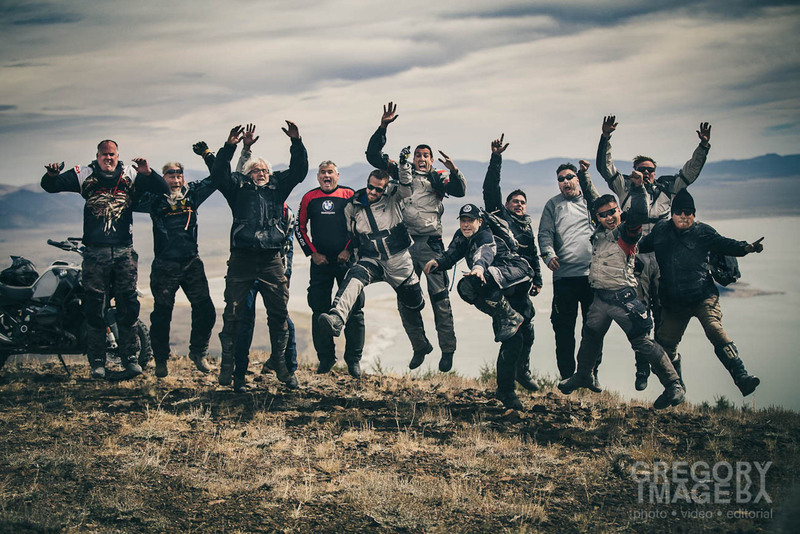 Obviously falling and getting tired from lifting your bike isn't so much fun, but with time and a few friends around, the challenging parts become a lot more fun. I personally cannot stand Harleys but I realize they are popular and there's a lot of people who enjoy riding them. That's why I do not care to bash them here or there because I really don't care what another person's choice of ride is. It has no effect on me whatsoever. Bigger bikes are just that polarizing I guess. That's why I think XLADV makes so much sense. We get it. There's no explanation or defense of our choices required. Previous entry Time for a modified leap frog? I think it's relative to what one is used to. The last bike I owned was a big, monstrous, 990 lb behemoth of a fully dressed cruiser - and that was without rider(s) and luggage. That bike easily pushed over 1150 pounds 1 up with gear (I did drop it once - two of us were able to pick it up adrenaline induced). Get off that bike onto my 570 lb Super Tenere and the Tenere feels like a bicycle under me. Ok, I'm exaggerating a little bit, but the point is that relative to my experience my XLADV bike doesn't really feel that XL. I did have a couple dirt bikes as a kid, but that was sooo long ago it's not really relevant. I can cruise down they highway in perfect comfort, hit the trail without skipping a beat then cross a stream and bounce over some rocks. When I see a nice camping spot I can stop, set up camp, enjoy some fine culinary delights over a fire, then get back on the bike the next day, bump over some more rocks, and then hit the highway and head home! What's not to love!? I've picked up the bike solo in the mud with panniers, and no it wasn't a cinch, but doable. To be honest I found the hideous panniers made it easier to pick up as they provided a fulcrum to assist in the lift. You know, the wonderful thing about getting a bit older (I'm 46), the less I care about what others think. I just don't care about what others think of what I ride. I only have to please me in this particular area. So, comments about my bike being too heavy or not off-road worthy enough... Meh... Don't care! Regardless, I do like the focus of XLADV. While I don't care about people bashing on my choice of bike, it's nice not to have the incessant background "noise". I'm sure as the site grows, the current peace/harmony will be more difficult to maintain, but I'd like to think that it's possible. Hopefully we can create something special that is positive and a fun place to spend time, taking about our overpriced, heavy and worthless off-ride bikes that bring us joy. For me a good analogy is smoking. I realize many people smoke and it's their right to do whatever they want. That people smoke doesn't bother me at all. I will have a cigar once or twice a year myself. But when I'm out to eat, the last thing I expect to deal with is smoke in a restaurant. Conversely, if I was a smoker and enjoying a smoke outside in an area that wasn't designated as non-smoking, it would irritate the hell out of me to have some non smoking activist come and lecture me about how "wrong" I am. As a matter of fact, something like that did happen. We had just finished the COBDR and were having lunch in Steamboat Springs sitting in an outdoor eating area (designated for smoking) and there were two of us enjoying a cigar, one a cigarette. The manager came out and asked us if we could either move into the parking lot or not smoke because they had their doors open and the smoke was coming inside. So we went to the parking lot but a short time later he came out saying that wasn't far enough. We said that's basically too bad. He threatened to call the police and we agreed that sounded like a good plan for him. The "big vs medium vs small" bike debate, like many "debates" on the internet, is one that quickly devolves from a debate to passionate disagreement to a fanatical argument that defies logic and excludes consideration for other's opinions or even their freedom of choice! It's been said that one person's trash is another one's treasure, and I think that applies to one's choice of motorcycles for their own "adventure" rides and travels. My personal experience is that the two 1000+ cc bikes I've owned (V-Strom 1000 and BMW R1150GS Adventure) were too big - for ME - to comfortably take off-pavement for extended rides. Now, I realize and agree that this was not the fault of the bike and has absolutely no bearing on whether they can handle offroading. It's simply that my riding skills, style and preferences resulted in an unpleasant and somewhat nerve-wracking experience for me, and that I was focused more on not falling than I was on enjoying the ride. So, I sold the 2004 BMW R1150GSA and for the same amount of money bought a 2012 Honda NC700X, and given it's list of options, it is turning out for ME to be a great "adventure" bike. I have crash bars, risers, off-road pegs, skid plate, dual sport tires and Givi Trekker bags and more. It feels "light" to me, with it's lower center of gravity, and the torquey engine and low red-lining engine (what some would call underpowered or wimp) has just the right amount of power for me and my gear. It's top speed is around 100 MPH, which is faster than I should go anyway, and plenty of top end. 60-70 MPG gives me a 200-mile plus range, which again is plenty for the adventure riding that I choose to do and enjoy. An adventure bike is, I believe, the bike that fits the rider's desires and inspires them to be more adventurous! An adventure can be a ride of a few hours, a day, a weekend, a month or a year or more - it's all dependent on what "adventure" means to each of us individually. So I think that most of the ranters and ravers should simply relax, enjoy and promote the bikes that they want to ride, but also respect other's rights and pleasures in not riding the biggest, latest and "best" bikes according to their opinions. As for me, my adventures are limited for now to the twisty two lane backroads of the Appalachian Blue Ridge and single lane gravel roads and National Forest tracks, and I'm having fun, increasing the distance of my rides, and improving my handling skills on the "right Adventure bike for me".